The Arena. Venue Cymru. Llandudno. Wales. Mike Peters Calling – What a week that was!!! The Gathering 17 went by so fast I’m still having trouble remembering everything that happened. I’ve seen some great photos of the event this year taken by Andy Labrow, Dr. Ian Clark and Jeff Pitt (Thanks guys), and still can’t believe how much actually happened. I thoroughly enjoyed the Friday night acoustic set, especially after the fears for my voice had subsided…. once I started singing ‘Shout To The Devil’ I was relieved to hear my voice still had the power I need to call on and knew that I was going to be able to deliver for the weekend. It’s always a big pressure leading up to The Gathering wondering if my voice will stand up to the demands of the event. I tried some different things this year, such as sitting down for the quieter songs. I felt this gave the performances a lot of power, and by sitting down I can play the picking guitar pieces in a more controlled manner. I also felt that seating the audience was a welcome change from the last few years as it invited and invoked more of a listening experience. I enjoyed sharing the stories behind such songs as ‘Statue Of Liberty’ and ‘Broken Silence’. I felt a real connection with everyone in the room as I sang the words to ‘True Life’ and felt like everyone was actually listening to them. Of course, being Mike Peters, I couldn’t stay sitting for too long and once I got to ‘White Noise’, I was ripping into the guitar chords as usual. This year, I was also using a ‘stompbox’ that picked up and amplified the beat of my motorcycle boots, creating a percussive bass drum sound that added some punch and dynamic weight to songs like ‘Marching On’ and ‘Deeside’. It was a great finale singing ‘Blaze Of Glory’ virtually ‘a cappella’ with everyone’s hands held high like mine. I was on stage for two hours and fifteen minutes but it felt like five to me. What an amazing evening, could it get any better than this. 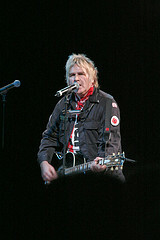 By Midnight, I was working at my computer downloading a countdown to close out the ’50 minutes with Mike Peters’ session. It’s hard to sleep at a Gathering weekend! 10.00 am Saturday Morning, and I was back on site finalising details for the Mastermind quiz with my old friend ‘Richard ‘Modnus Modnusson’ Jones and running through the projected answers that would be displayed on the screen at the end of each section. I worked out most of the questions myself this year and had illuminated all of the answers with an appropriate image or film. The best one was either the clip of a rain soaked Mike Peters singing Blaze Of Glory on the top of Snowdon or Top Of The Pops 1984 with Madonna. 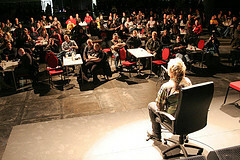 While the quiz was going on I was in a production meeting with the film crew about the electric show that night. There was an introduction to co-ordinate and also which way to go with the acoustic walkabout. Before long I was back on stage presenting the mastermind champion with his trophy and then I was thrust into the limelight myself. J.J. Haggar and Mod put the questions to me either on behalf of the fans or from their own knowledge of all things Alarm / Mike Peters. It was an interesting occasion to be part of and the questions were diverse and challenging. The perfect set up for the electric set. Once the clock had ticked off the 50 minutes it was into the light of the day for a photo call and a cheque presentation of £16,000 from Mackenzie Jones Solicitors of St. Asaph of North Wales who had given up the proceeds of their summer charity ball to the Love Hope Strength Foundation. Once again, it was great to see so many familiar faces and more than a pleasure to pose for photographs, sign photos and autograph CD’s for all concerned. I was back in the production suite above the venue just after 14:00 and with projectionist Gary Overington in tow, we resolved the sequence and timing of the screen projections for the forthcoming concert. During the 50 minute question time, I had the idea of using the countdown to begin the concert and so this was inserted into the software along with a host of films and Alarm related images. The set list had been worked out in advance during rehearsals with the band but it was still three sides of A4 paper long. The soundcheck went fairly smoothly and we ran through the newer songs that would be performed later. In the run up to the show I was going through all the guitar changes and harmonica requirements with our on stage tech team of Andy Gray, Jon Gray, Chris Webb and Richard Henry. The dressing room was alive with the various tech requirements of each member of the band. T-shirts were having sleeves cut off and being doctored for the stage, honey and lemon was being prepared and gargled and seats were being battered by Steve Grantley’s drum sticks as he warmed himself up for the physical demands of powering The Alarm through three hours of intense rock and roll. At twenty five to nine we were ready to rock and the word went out to the crew. The countdown appeared on the screen as DJ J.J. played ‘Whiskey In The Jar’ by Thin Lizzy over the P.A. It was like a new years eve celebration as the audience chanted down the last 10 seconds. At zero the lights went down and the poppies hit the screen, a short intro tape announced our arrival on the stage which we entered via steps behind the drum kit and launched into Loaded. 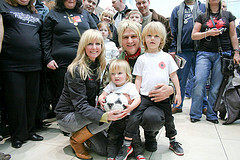 It was a four song opening that caught most people by surprise especially ‘Father To Son’ at number four. ‘Riot Squad’ sounded great late on and will be a future live classic I’m sure. We left the stage as the sound of the ‘Twenty First Century’ filled the room. End of part one! After a mad scramble back stage, I was ready to head into the audience for part two. I wasn’t quite sure how this was going to work out. The basic plan was for me to get in amongst the audience with my guitar and voice wired up to radio pacs. This part of the show was to be filmed and projected ‘live’ on the screen so that no matter where I was in the crowd the pictures would be relayed to all. I don’t know who was more surprised when I entered the room and started singing, me or the fans. Most people were watching the screen and I could see some people with totally surprised look son their faces when I appeared from behind them singing ‘Coming Home’ and blasting out the riff on my acoustic. I absolutely love singing the songs in amongst the crowd. The power of everyone singing along is hard to describe. My brother Steve was by my side as I sang ‘Walk Forever’ to my extended Alarm / Gathering family. I counted in ‘Rescue Me’ from the floor and Steve and Webby helped me through the throng and back to the stage. It was wild with everyone doing the pogo around me. I managed to get over the barrier and we were into part three of the show. All the big ones were in the the third quarter of the gig, ‘Without A Fight’, ‘Drunk & Disorderly, ‘Marching On’ and ‘Hiding’, guitar strings started to break and a small bit of chaos ensued as I slipped in a version of ‘Bound For Glory’ that wasn’t on the set list. Back down the stairs after ‘Blaze Of Glory’ which never really ends and we regroup for Part Four. A journey back in time to the ‘Rise’ solo era with four songs – ‘Ground Zero’, ‘In Circles’, ‘Rise’ and ‘Burnout Syndrome’. I could see the my two little boys Dylan and Evan sat with Jules at the side of the stage during ‘Rise’ and very nearly walked them on to the stage but by the time I had looked back they had disappeared. We brought Dave Sharp back onto the stage for ’68 Guns’ during the third encore which was cool for the ‘old school’ out front. For the ‘New school’ there was ‘777 Clash’ for encore three and the weekend came to a close with entire gathering community joined together in ‘Love Hope And Strength’. As I climbed down from the stage my two boys were waiting for me and I scooped them up into my arms and they stayed with me while Jules wrapped up the gig and made sure everything was as it should be. Jules, my partner in crime hasn’t stopped. I don’t know how she does it. Prodding and pushing and keeping us all on our toes. When the time came to vacate the venue, I had every intention of going to the after show party but when you’ve got two little boys (aged 2 and 4) asking you to take them home then there is no competition no matter how much of a rock and roller you are. 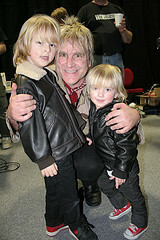 During the ’50 minutes with Mike Peters’ session someone asked “Where does the rock and roll Mike Peters end and the real Mike Peters begin?”. Well now you have an answer!